In January 2013, the Edison Electric Institute published an infamous white paper, Disruptive Challenges: Financial Implications and Strategic Responses to a Changing Retail Electric Business. Rising rates for retail electricity in some parts of the country. The white paper warns that these “game-changers” could have dire consequences. In particular, the authors highlight a death spiral of lost sales to distributed energy and escalating costs for remaining customers, a headwind that would spur further defections. These headwinds would weigh heavily on earnings, erode balance sheets and result in dividend cuts. 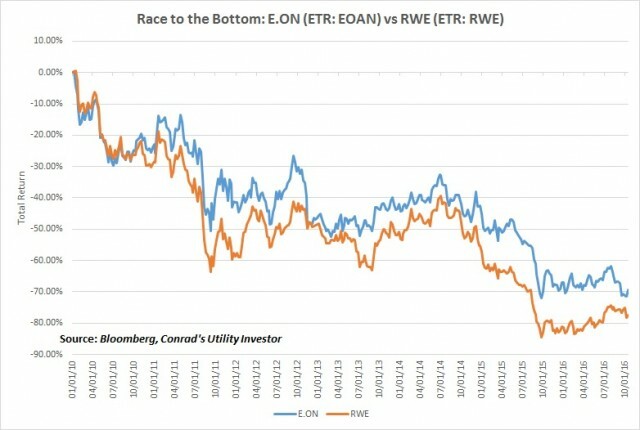 Germany’s largest utilities—E.On (Frankfurt: EOAN, OTC: EONGY) and RWE (Frankfurt: RWE, OTC: RWEOY)—find themselves locked in this death spiral. RWE no longer pays a dividend, and its stock price has plunged by more than 85 percent since early 2010. E.On has cut its payout by about two-thirds and has plummeted 82 percent over the same period. Even after these extraordinary declines, the worst may be yet to come if the German government follows through with plans to shutter the country’s nuclear power plants and force the two utilities to pay a staggering EUR23.3 billion (US$25.7 billion) for liabilities. A similar fate is unlikely to befall US utilities. Instead, SolarCity Corp (NSDQ: SCTY) and other would-be disruptors find themselves locked in a death spiral. SolarCity loses more money with each incremental sale, necessitating a takeover offer—in reality, probably a bailout—from sister company Tesla Motors (NSDQ: TSLA). Many of the forces that have buried German utilities have become potential tailwinds for their US counterparts. Southern California Edison, a subsidiary of Edison International (NYSE: EIX), last month released a white paper laying out a far brighter future for electric utilities. This outlook envisions the distribution grid evolving into a “plug-and-play” platform that can accommodate distributed energy resources. For decades, the generation and distribution system consisted of baseload power plants whose output is transmitted over high-voltage lines to substations and then end-users. In contrast, Southern California Edison contemplates a grid that absorbs generation from “hundreds of thousands, even millions of distributed resources” and delivers an even flow of electricity that matches demand. Such a system, in theory, would be less vulnerable to disruptions related to equipment failure from ordinary wear and tear as well as extreme weather, natural disasters or terrorism. Some of this resilience would stem from the profusion of distributed generation, but the grid would also be much smarter—that is, operators would be able to identify and work around problems much more quickly. Smarter systems also improve efficiency and reduce waste, which leads to cost improvements. Other benefits for customers include the ability to participate in wholesale electricity and capacity markets by installing a rooftop solar-power system or another form of distributed energy. For Southern California Edison and other utilities, the biggest challenge associated with developing a modern grid is also the chief attraction: Getting there will require billions of dollars of investment over the next decade—spending that they will recover in their rate base. These capital expenditures on computing power, advanced communications, energy storage, switches and wiring, smart meters, monitoring systems, electric-vehicle chargers and grid intelligence will drive earnings and dividend growth. Southern California Edison’s last major spending boom occurred in the 1960s and 1970s, when the utility plowed money into a number of baseload power plants to support growing electricity demand. These projects almost universally incurred huge cost overruns stemming from design challenges as well as inflation in labor costs, commodity prices and interest rates. To worsen matters, regulators refused to pass all these costs through to customers. The grid of the future, on the other hand, will emerge from a series of smaller projects, making it easier for utilities and regulators to agree on project costs and an acceptable rate of return. Relatively short development times likewise reduce the risk and magnitude of cost overruns. Southern California Edison’s investments will be covered in the multiyear rate plans that the company files with the California Public Utilities Commission (CPUC). The utility’s 2018-20 general rate case will enumerate the proposed projects and costs, and the CPUC will review this list and assign an allowed budget for each item, a designated return on investment and a corresponding rate increase. This process stands in stark contrast with the 1970s and 1980s, when utilities recovered their investments, if at all, well after completing their multiyear projects. And unlike during the last construction boom, Edison International enjoys an enviably low cost of capital, with the common equity trading at 19 times earnings and the company’s 30-year bonds yielding 3.48 percent to maturity. Robust system investment has enabled Edison International to grow its quarterly dividend by more than 35 percent over the past two years—despite flat electricity sales. In California, customer rates have already decoupled from demand. With management guiding for about $4 billion in annual capital expenditures in coming years, the utility should be able to grow its rate base by 6 to 7 percent per annum. Delivering on this guidance depends first and foremost on maintaining the support of California regulators throughout the transition. Fortunately, the utility’s goals align with the CPUC’s aims. What remains to be seen is the price tag, with the availability and cost of energy storage and other emerging technologies constituting a big X factor. The extent to which Southern California Edison’s plug-and-play grid helps consumers to control their energy costs will be even more critical over the long term. And Edison International has other concerns, including litigation over who will foot the bill for permanently closing the San Onofre nuclear power plant and an arbitration case with Mitsubishi Heavy Industries (Tokyo: 7011) over alleged equipment and design flaws. Political support for California’s energy transition could also erode in coming years, forcing the utility to scale back its investments or risk regulatory disallowances. And opponents argue that the concept of a power grid is outmoded, no matter how decentralized, and will continue to fight Southern California Edison’s plans even if they support greater adoption of clean energy. The more California relies on solar power via distributed rooftop systems and utility-scale facilities, the more the state will need shadow capacity to balance supply and demand. Gas-fired peaking plants currently help to offset these shortfalls, though reliability can be an issue and efficiency is a concern. However, General Electric (NYSE: GE) this month unveiled what could emerge as a superior solution: The world’s first battery-gas turbine hybrid, which provides peaking power that’s more responsive, reliable and efficient than existing capacity. This announcement follows on the heels of Edison International signing contracts for battery-based storage facilities built and operated by AES Corp (NYSE: AES) and a partnership with Tesla Motors to roll out electric vehicles and battery storage. The utility has also partnered with home-automation specialist Nest Labs, a unit of Alphabet (NSDQ: GOOGL), to encourage households to install smart thermostats that improve efficiency and help to reduce energy use. All of these initiatives threaten to undermine Edison International’s legacy revenue streams. However, these trends create opportunities for the utility to invest in a smarter grid, reduce costs and improve system reliability. Bottom Line: Critics who dismiss utilities as dinosaurs doomed for extinction aren’t paying attention to the forward-looking moves made by Edison International and some of its peers. Although our short-term bet against utility stocks has generated a 20 percent gain since early July for Conrad’s Utility Investor subscribers, valuations in the sector continue to hover around unsustainably high valuations. Stay disciplined. Overpaying for quality can be hazardous to your wealth. Full Disclosure: I’ve owned Edison International in my personal account since the 1990s, when the company was called SCE Corp. I look forward to talking with Edison International’s management team at the Edison Electric Institute’s financial conference in early November. 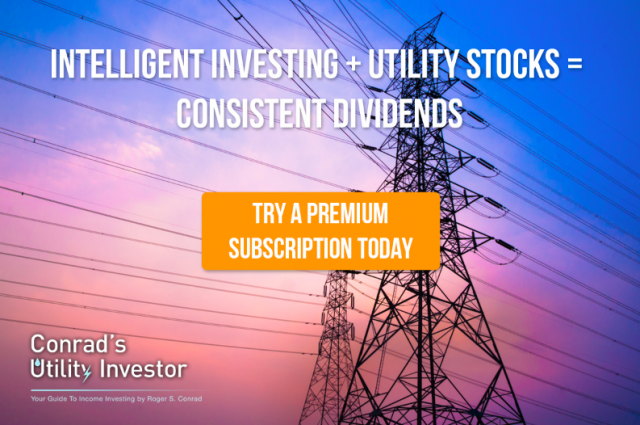 Conrad’s Utility Investor subscribers will receive my exclusive takeaways and best ideas from two days of conversations with management teams and institutional investors—the kind of on-the-ground intelligence you won’t find in any other newsletter.